Location: entrance of Val Canzoi (556m , orographic right side). Municipality of Cesiomaggiore (Bl). Access: From Arson country hamlet (Feltre) follow an easy asphalt road or from Val Canzoi take the road climbing to the town with hairpin bends and leaving from the junction on the left (if you come from the south) between Serra bridge and Le Ave.
Environmental context – Description of the site: the village lies on a hillock (glacial terrace), on the orographic right of Torrent Caorame, in Val Canzoi. The village, in a dominating position at the entrance of the valley, is set in a beautiful landscape having as a background the southern walls of Sass de Mura. Situated at 2 km from Arson and 3 km from Soranzén, it lies within the administrative borders of the Municipality of Cesiomaggiore, in an area outside the Park perimeter. Architectural features: rural village with particularly intact original plan and beautiful examples of rural traditional buildings (gallery buildings in the Feltre style). Great historical-environmental value. Still inhabited, the village preserves its original urban plan and is characterized by a particular settlement structure deriving from the local morphological and climatic features. The buildings cling to a hillock creating a compact and constructed nucleus, in which the distance between the buildings do not compromise the good sun exposure conditions, and are connected with a system of paths and small cultivated terraces supported by dry-stone walls. According to the ancient rule of the tillable land saving, in the nearby slopes, further buildings have been arranged in linear systems consisting of houses and rural buildings built along the same contour line. 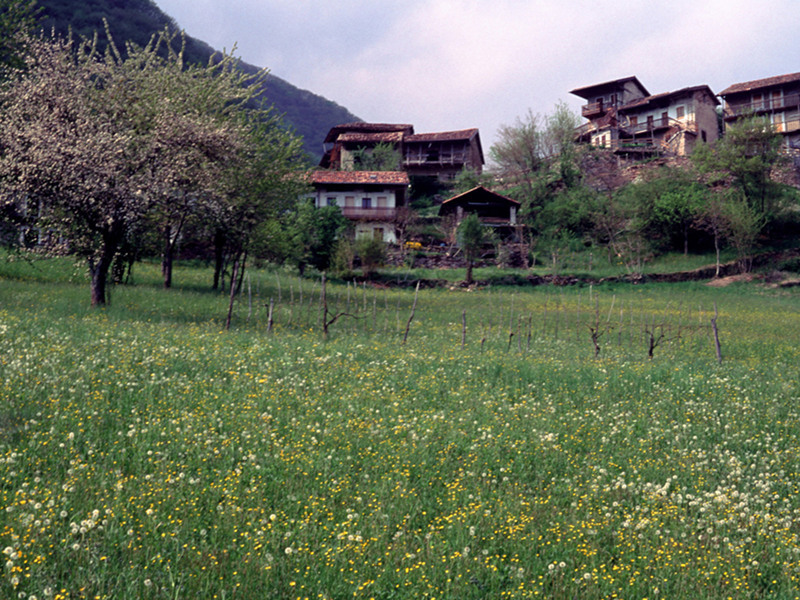 The buildings, strictly with a southern exposure to exploit the light of the sun, have a brickwork side "closed" upstream and "open" downstream, where we can find the characteristic wooden gallery with the double function of distribution element (vertical and horizontal to the various premises of the house) and of drying area of the agricultural products (cereals, walnuts, pulses, etc.). In the linear groups of houses (of great interest the one upstream), the basic house structure usually has recurring features: closed on three sides, it is open towards the south on the wooden gallery; it consists of the kitchen and eventual storerooms on the ground floor and of rooms on the upper floors, while the toilets are usually outside the house. When on the ground floor there is the stable, on the upper floor there is the hay loft. The wooden galleries guarantee the connection between the various levels of the house and between the rooms on the same floor. In the first post-war period, the village was inhabited by several families and had a population of over 100 inhabitants, whose main source of income was the charcoal market (obtained from wood). Today the village is almost abandoned: only a dozen people live there. Some houses have been recently recovered; however, the village is in decay, and several buildings are mere ruins. One of the main features of the traditional house of the area of Feltre is the presence of both the rural building and the house in the same building, which acquires a tapered shape. On the ground floor there is the stable, eventual outhouses, and the kitchen, while the upper floors house the rooms and the hay loft, on the stable. The ever-present large loft was used to preserve the wood dry. The outer stairs, in wood but with the first steps usually in stone, lead to the wooden galleries of the upper floors, where the independent entrances of the various premises face. The characteristic wooden gallery, born from the need to dry the agricultural products, enriches with its vertical and horizontal rhythm the image of the village of Montagne. It has the double function of outhouse or drying house and of continuation of the rooms towards the outside, protecting at the same time the main accesses of the building. Moreover, it represents the system of horizontal and vertical connection between the premises of the house, lacking of indoor stairs and doors. The characteristic wooden gallery of the traditional house of the area of Feltre is usually supported by a series of wooden boards from above, and has the parapet formed by a series of vertical wooden laths. Its width is usually of approximately 150/120 cm, enough to protect the walls from the atmospheric agents during the winter and to enable, at the same time, the low sun rays to reach the rooms; during the summer, it keeps the walls cool. At the edges, the wooden gallery is always laterally closed up by a system of wooden boards defending it from the wind. The wooden elements (stairs, supports, etc.) are always fixed to the ground with stone elements, in order to avoid humidity. In the vault spaces under the staircases, small shelters for the domestic animals or the tools are usually obtained.